in the heart of Cap Esterel holiday village, a fantastic resort with many restaurants, bars and shops, the hotel overlooks the Agay bay amongst 518 acres of nature and gardens. 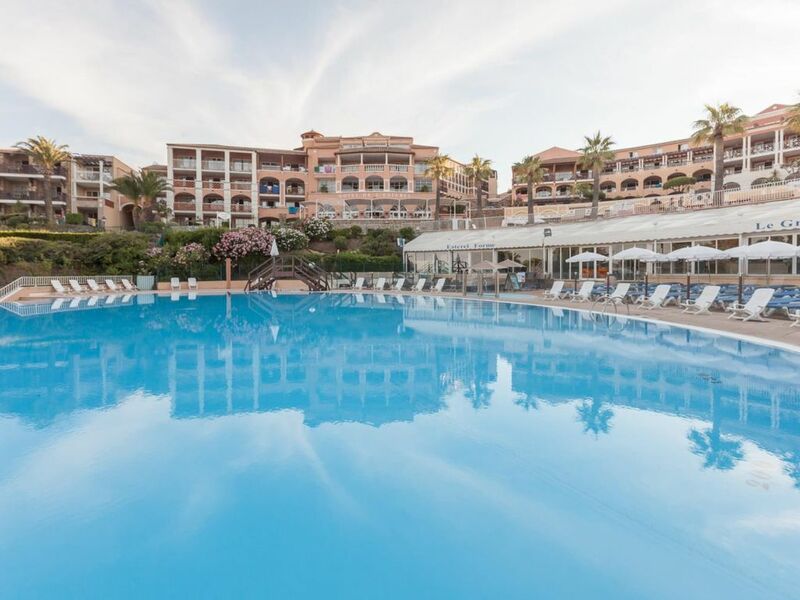 If you enjoy the activities and entertainment typical of a holiday village but equally like the classic comfort of a hotel, the Hotel de l'Esterel is for you. With double, triple and quadruple rooms to choose from, you will enjoy stunning views of the Mediterranean Sea and the golf course. During the summer Dramont beach, just 1.5km away, is easily reached via a small train. A hotel in the heart of a holiday village to make the most of over 40 activities. Vast heated water complex with swimming pools with wave machines and infinity pools. Children's and teens' clubs from 3 months to 17 years and on-demand courses. - or with three single beds. * Bathroom with hair dryer and toilet. * Air-conditioning, television, mini-bar, safe (payable use), direct telephone line, balcony or terrace. Accommodation description : 1 bedroom, 1 bathroom and 1 toilet. Bedrooms description : 1 bedroom with 2 single beds and 1 extra bed or 1 double bed and 1 single bed. Bathroom description : 1 bath or 1 shower and 1 toilet. 9km away from Saint-Raphaël, 32km from Cannes and sitting at the bottom of Esterel's red massif in the Var region, Hotel de l'Esterel benefits from a fantastic location, overlooking the Mediterranean Sea. - Quiet or lively, the Cote d'Azur boasts many beaches and creeks. - The countryside is perfect for hiking fans and nature-lovers. - The animated region welcomes all to discover its villages and traditions. Visit the Marineland sealife park in Antibes. The Jean Cocteau chapel in Fréjus and Fréjus port. Archeological museum in Saint Raphaël. The Naval Troops Museum in Fréjus. Water sports activities and sea excursions in Saint Rapha��l. Walks in the Esterel mountains. Canyoning in the Verdon gorges.